With College Football starting a week from Saturday we take some time to look at several underrated teams that are not getting enough love and respect ahead of the 2018 season. 4.- Baylor: it’s true that the Bears are not going to win the National Championship, but they are definitely not going to go 1-11 like they did a year ago under Matt Rhule’s first year as head coach. 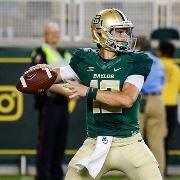 This team could even reach a Bowl game this year because they have a young quarterback in Charlie Brewer, that has shown a lot of ability in throwing the football on the run and can move around well to escape pressure. Brewer, a true freshman in 2017, played the last four games of last season and proved that he can provide explosive plays in this offense. It would not be shocking to see Oregon pulling a few upsets and even getting off to a fast start. If they play their best the Bears could start 4-0 before playing Oklahoma on September 29. 3.- Northwestern: Pat Fitzgerald’s team is riding a lot of momentum into this season as they finished 2017 winning their last eight games, including a 24-23 victory against Kentucky in the Music City Bowl. Their starting quarterback Clayton Thorson tore his ACL in their Bowl game last year, but he’s since recovered and is expected to be the starter for their week 1 game against Purdue on September 30. The Wildcats are a team that always play great defense, so they can make some noise in the Big Ten if they get some consistent production from their offensive unit. 2.- Boston College: The Eagles feature A.J Dillon, who last year as a true freshman became a freak show at running back to end the season with 1,589 yards. This year he could post similar or even better numbers and is being mentioned as a dark horse candidate to win the Heisman Trophy. The Eagles are another team that started getting some momentum late last year to finish the season 7-2 and if they continue to show improvement in 2018 they could surprise a lot of people in the ACC and the nation. 1.- Michigan State: The Spartans won 10 games a year ago and still, somehow no one seems to be taking them seriously in the offseason. This is a team that is built to win now as they have 21 starters coming back from 2017 including Bryan Lewerke, who has been fantastic at quarterback as he became the first signal caller in school history to throw for 2,500 yards and rush for 500 yards in the same season. The Spartans can make some noise in the Big Ten in 2018 because they have a favorable schedule with including home games against Ohio State and Michigan. Don’t overlook them because it wouldn’t be surprising to see the Spartans end up their 2018 season with a lot more victories than people expect.